I spent a couple of days looking around local stores for hinges that would work for the tool chest. 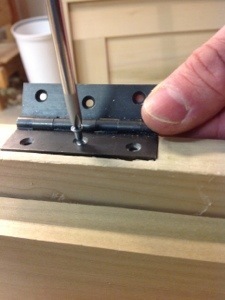 It is very difficult to find narrow hinges that will work on the 7/8″ carcass. Finally I ordered hinges and a lock set from Horton Brasses. They seemed expensive, but are very well made and operate smoothly. I’m thinking money well spent and will add to my tool roll for future reference. 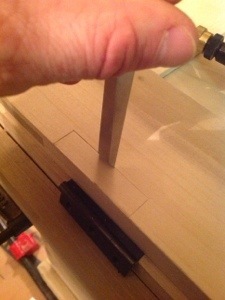 Traditionally when installing hinges, I have used a powered router and a chisel in the corners with varying success. On the chest I did it all by hand in less time, with much better results. The hinges were laid out using a marking knife and round mortising gage, then I deepened the marks using a chisel. I adjusted my hand router to a portion of the total depth and after a few passes reached final depth and cleaned up with a chisel. Drilling the screw holes with my eggbeater drill gave me good control and I attached the hinges with the steel screws included in the package from Horton Brass. They also sent brass screws which I will install when the tool chest is complete. Best of all, I didn’t all in the living room while the shop was too cold to work.